But did you know that this disease is an epidemic affecting millions of people? Right here in Michigan there are 180,000 people living with the disease and many more affected by serving as their caregivers. These numbers are staggering and will continue to rise, unless something is done. The Alzheimer’s Association advances research to end Alzheimer’s and dementia while enhancing care for those living with the disease. We provide free educational programs, a 24/7 Help Line (800-272-3900) and community events aimed at increasing care, concern and awareness of Alzheimer’s disease in Michigan. Participate. Start an Alzheimer’s Association Walk to End Alzheimer’s® team at act.alz.org/monroe2018. 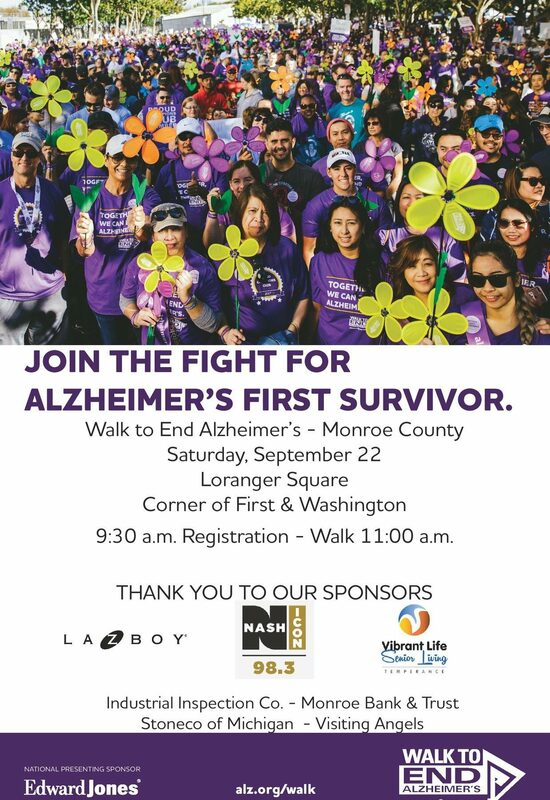 You can participate together at Walk to End Alzheimer’s in Monroe on Saturday, September 22 at Loranger Square in Downtown Monroe. Register your team at act.alz.org/monroe2017. Donate a Silent Auction Item or Basket: This year, we will be having a silent auction at the walk! We are in need of donations of silent auction items. All proceeds will be going to the Alzheimer’s Association. Volunteer: We’re always in need of people to help set up, tear down and work various stations before and during events. We also need volunteers to spread the word about Walk by putting up posters, fliers and other information around the community. Sponsor. Purchase a Sign of Support to display at the walk for $100 for the first sign $50 for each subsequent sign. Title sponsorships are available starting at $1,000 which includes name or logo on the official event t-shirt and event signage. Participating as a sponsor for the walk or hosting a corporate team communicates to your employees, your customers and your community that you recognize the importance of supporting the Alzheimer’s Association as we work toward finding effective treatment and, ultimately, a cure.